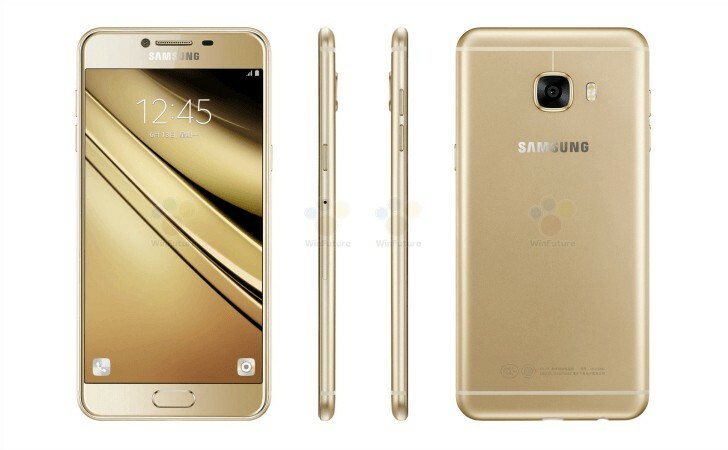 Upcoming Samsung Galaxy C5 & Galaxy C7 are rumored. Check Galaxy C release date, specs, features and other details. So after Samsung filling up the Galaxy A, Galaxy J with all the numbers, it will be Galaxy C, the new line of smartphones by the Korean giant. A couple of mysterious Samsung Android powered smartphone reached India for testing few weeks back. These devices are news, makes a pretty heavy impression because they are powered with Super AMOLED display. The Samsung Galaxy C5 will be powered with Cortex A53 Octa core processor clocked at 1.5 GHz, driven by Qualcomm Snapdragon 617 chipset. There is Adreno 405 GPU to handle graphical processing unit and it will be running on Android 6.0 Marshmallow operating system out of box with TouchWiz UI customization on top of it. The Galaxy C5 SM-C5000 will be sporting 5.2 inch Super AMOLED display with 1280 x 720 pixels HD resolution. It will be equipped with 3000 mAh Li-ion battery. A recent report by SamMobile confirms that it will be sporting a metal build body. The Galaxy C5 is expected to be priced at Rs 15,000 in India which is $225. Internals of Galaxy C7 remains same as that of Galaxy C5 but battery capacity and display size is changed here in the case of Galaxy C7. Codenamed as CM-C7000, the device will be sporting 5.5 inch Super AMOLED display with 1280 x 720 pixels HD resolution. It houses 3250 mAh Li-ion battery and does include Qualcomm’s QuickCharge alongside Samsung’s Ultra power saving mode options. Hoping that Samsung will be announcing these two smartphones very soon and it will be following the same trends as that of Galaxy J with Galaxy J1, Galaxy J3, Galaxy J5 and Galaxy J7 being unveiled in many parts of the world. So, we are definitely sure that, going to the future there will be Galaxy C1, Galaxy C3 as the upcoming Galaxy phones.